The history of P Falla and J H Bolden. In the early 1900's Falla fitted a seed sower and fertilizer box across the front of his plough which he called the Victory plough. In August 1902, Falla was demonstrating the Victory on a local farm. Falla, with son-in-law JH Bolden patented the Victory (Pat No 18552). It enabled a measured quantity of seed and fertiliser to be sown in a similar manner to the modern combine. For many years it was one of the most useful farm implements available. Falla died in 1908 and J.H. Bolden continued the company. Bolden patented improvements to the seed and fertilizer attachments in 1909. Bolden produced the last skim-plough in 1952. 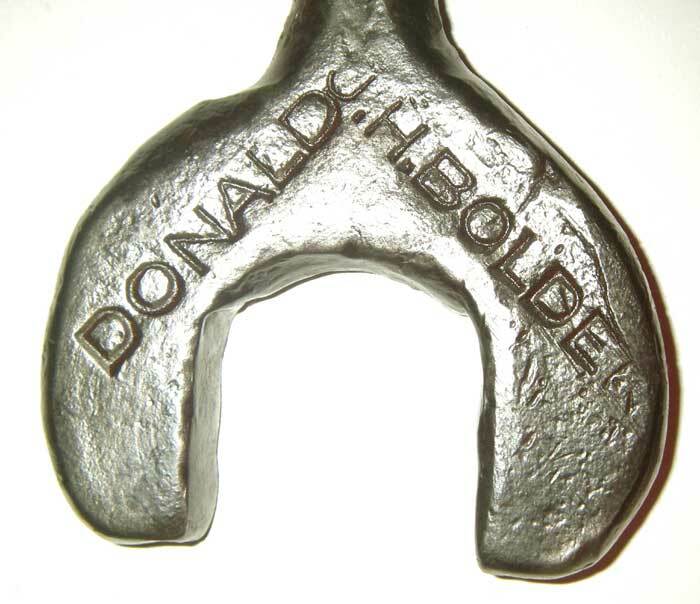 Spanners marked "Falla / Donald" and J H Bolden are rare, usually shaped like a rat tailed podger, but also a double open ended spanner as bove.